This is the "The Edge" mod pedal? The model that he uses for the Elevation Intro? What is the difference between the other you posted¿? The Kay Fuzz Tone is the original. 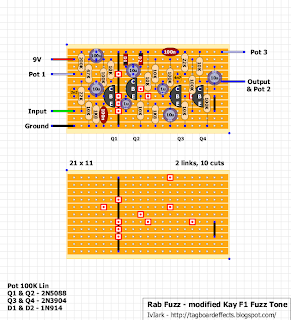 The only difference is the transistors (although I laid out the Kay to use modern transistors anyway) and the Rab Fuzz has a 200K resistor from pot 1 to stop the effect going silent at one side of the rotation. Because of this mod the pot was also changed from 250K to 100K but that is it. Hey man. What's the difference between 250k and 100k pot? Change the sound? If you look at this one it has a 200K resistor from lug 1 of the pot to ground which the Kay didn't have (at least it didn't in Analogguru's schematic that I did it from). That means that in one position the Kay would be silent whereas this one will always have at least 200K to stop the entire output being dumped to ground. So the sweep on this will be different and there will be some sound at any position of the treadle. If i don't change the pot of my crybaby (250k) would i have to change any thing? I'd lower the lug 1 resistor. It may be worth socketing and experimenting what gives you the best sweep to your ears. could I sub germanium diodes in for the 1n914 silicons? would 1n60's drop in? or should I use 2 (1n60's) in series for d1 and 2 (1n60's) in series for d2? You could but germanium will end up a lot quieter than silicon diodes so I'd probably recommend using sockets to allow you to experiment and choose your favourites without having to do a lot of desoldering. is there anyway to get a volume control on this baby? Also my build sounds great in tterms of the fuzz (well... it's great and nasty), but the sweep of the wah is pretty pointless. It really just has two sounds- bright and dark. I cannot hear any in between or ANY sort of sweep. it's just like hitting a switch once you pass some point in the middle of the pot. I had something similar going on with my colorsound inductorless wah buil. it goes like bass for the first 49.99% from up going down- then it switches to treble and stays the same for the rest of the 50% down. could it just be my pot? It measure fine and seems to have a decent enough taper... maybe my crybaby has an audio pot for somereason instead of linear that I need? the wire that says "output and pot 2"... does that mean one wire to pot 2 then to output. or two wires? one to output and one to pot 2? It needs connecting to both the output and second lug of the pot. So either take 2 wires from the connection, one to each point, or daisy chain to both. has anyone built this and gotten a good amount of sweep? Mine just directly from bass to treble with no in between WHATSOEVER... it's just like hitting a switch rather than sweeping a pot. Did I screw something up or is this normal operation? I hadn't even heard of these before I did the layout and don't know how they're supposed to sound, but if you look at this clip, about 12 seconds in he moves it from the toe down to heel down position and I'd say that sounds just as you describe, and so just flipping between one extreme and the other with little or no sweep. word- it is kindaaaa cool to sustain something and hammer up and down... but a wah pedal before or after would be better for sure. I want to build this in a regular stompbox. 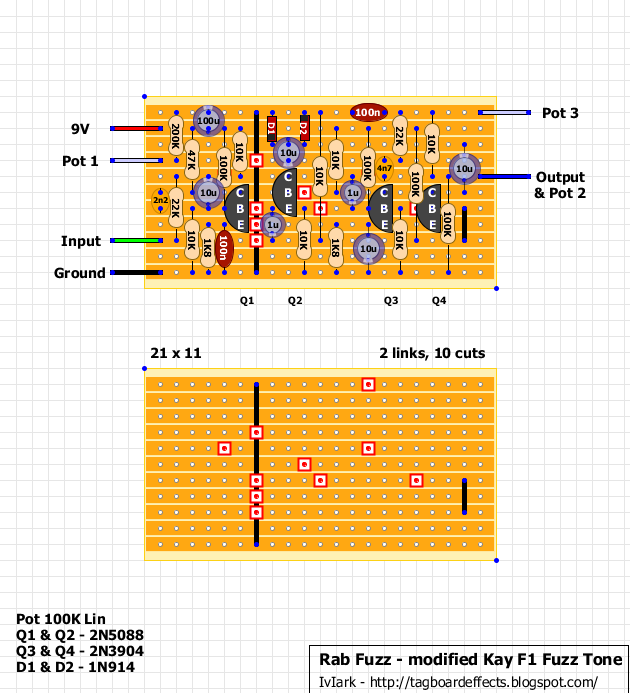 Can I use a regular B100k pot for sweep and a A100k for an added volume control ("sweep" 2 to vol 2)? Any resistor to socket to adjust the output level? This seems to have some volume boost. And btw pot 1&3 has to be reversed to make it go brighter CW. so i finally revisited thisand upon slowly moving my wah shell up and down i noticed there is some more sweep to be had, i can get at least 4 sounds and thats with a super jumpy crybaby pot in a wah shell. I opened up the shell and found all the sweep to occur between (pins 1 and 2) 80k (bass) and 60k (treble- and even possibly 70k) and between pins 2 and 3 0k (bass) and 9k (treble) a... possibly even 80k and 70k. i'm not that schooled with pots on this level. this is such a sick fuzz- when you bend double stops you get this synth sounding sub bass hit- and i know there are some in between sounds in this pedal that would make it worthwhile to put it into a wah shell. so- i just opened up this wah enclosure again and realized that I messed up this pedal. back a few years tayda sent me 1n60 diodes labelled as 1n914's. Being a newb, I didnt measure the difference and never really thought anything of it as the next ones i got were right (just thought they looked different) Upon looking at old circuits in my junk pile I realized some circuits got a lot lower forward voltage than they bargained for. I'm not sure how it would affect this circuit besides more clipping. would it have caused the sweep issues I mentioned above? Something to do with the HFE of the transistors? stupid question : Q1 at the left, then to the right q2, 3, 4? I suppose.